How Much Is My Antique Schwinn Bicycle Worth? Locate the serial number on the frame of your Schwinn. The location of the serial number will vary from year to year, but once you find it this can be very useful information in determining exactly what year your bicycle was made. It can also help you to make sure you have a genuine Schwinn on your hands as opposed to a knockoff. The serial number will only be really useful if your bike is from 1948 or later, as all serial number archives prior to that was destroyed in a fire. If your bike is from after 1948 and you have found the serial number, learning with model of bicycle you have is easy; Go here (http://schwinncruisers.com/serial-number.html_) to enter the serial number of your bicycle. If your bicycle pre-dates 1948, go here http://schwinncruisers.com/history/ to learn more about the styles and models of Schwinns manufactured during different time periods and to get a good idea of what year yours would have been made. As with any antique, Schwinns that are in better condition will sell for more than Schwinns that are in poor condition. It is also important to consider how many original components the bike still has – don’t restore a bike so much that too little of its original materials are now nonexistent. 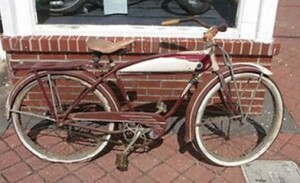 For example, the bike pictured below is clearly no longer in rideable condition, but is advertised for $1200 – perhaps a fair priced based on how many original components of this 1952 bicycle are still intact. It might go for more money if the original parts were in better condition, but the value might decrease if restoration takes it too far away from its original history. Ultimately, the best thing to do is research – find what other bicycles of your similar make, model, and condition are selling for and set a price based on that!